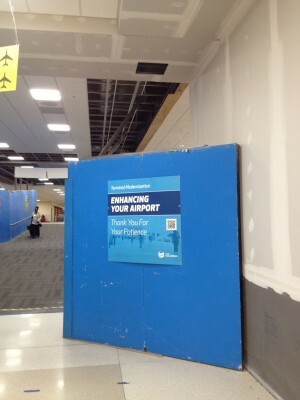 The B concourse at Port Columbus has undergone a bit of a facelift, and the renovation process has addressed two of the new issues raised by modern travel. First, what should be placed right beyond the TSA checkpoints, to help those sock clad, disassembled travelers who emerge stumbling from the process, holding up their pants, clutching belt and shoes, and trying to navigate their roller boards past the other huddled masses? 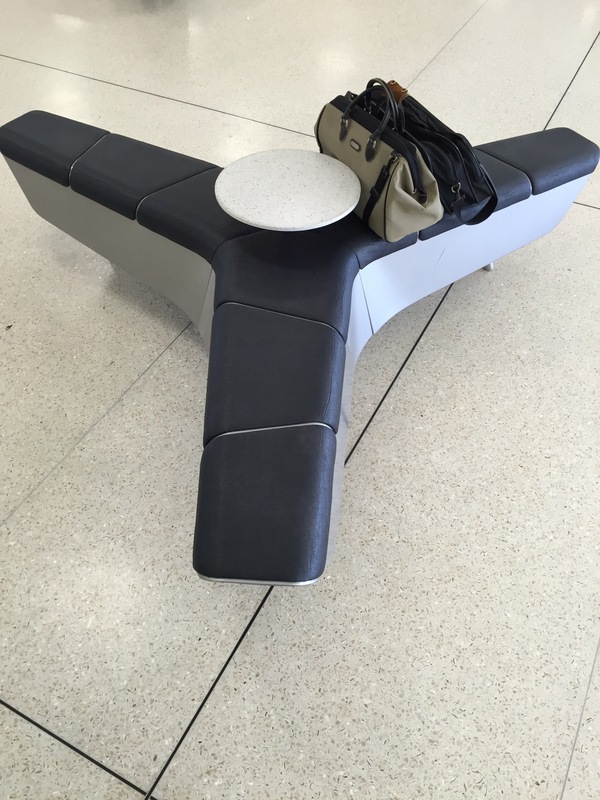 Port Columbus has come up with star-shaped benches just after the TSA area that seem to work pretty well as a drop bags, shoe-tying, put yourself back together gathering point. Second, what about seating areas at the gates? 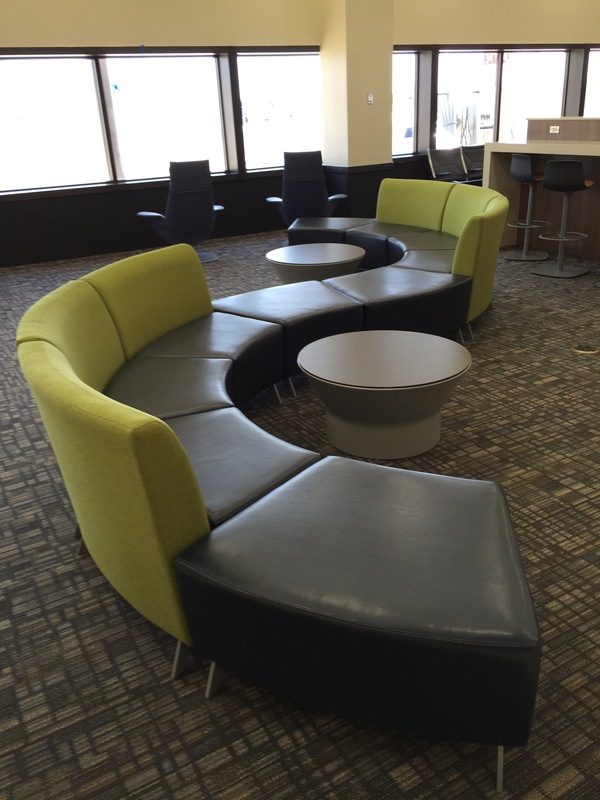 Before, the airport just had rows of back seats; the new feature is serpentine pods with low tables that look like the interior of the Jetsons’ house. The black seats are still there, but the serpentine seats at least break up the monotony. You’re not going to use them if you need to charge your devices, though. When you’re traveling, you thank the gods of functional modern electrical devices for every accessible and charged outlet. Outlets where you can sit on a chair, rather than squatting on a dirty floor, are signs of a particularly benevolent deity. Thank God For Power! The fickle gods smile upon Port Columbus passengers, although sometimes they fake you out with inoperative outlets. As I said, they’re fickle. If Such Signs Are Necessary . . . .
As you enter Port Columbus airport from the parking garage, you encounter one of those exceptionally long escalators with this sign. My God! 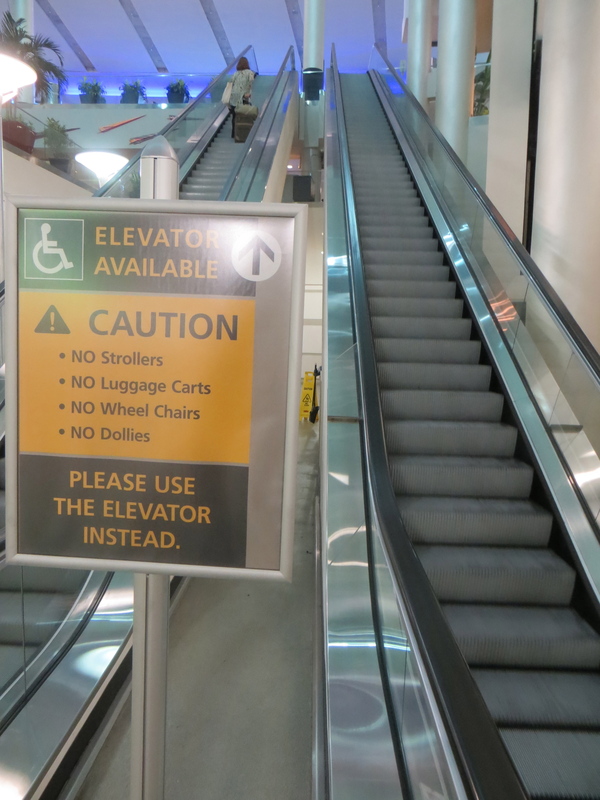 Is it really necessary to warn people not to try to wrangle a person in a wheelchair onto an escalator and support them as the escalator slowly rises to the next level? Could some imbecile actually have tried to do it — and then sued because no warning sign was posted? You might as well put a warning sign on a lawnmower cautioning people not to use it to cut hair. It began in Houston, waking up earlier than I would have liked and then getting ready for work. 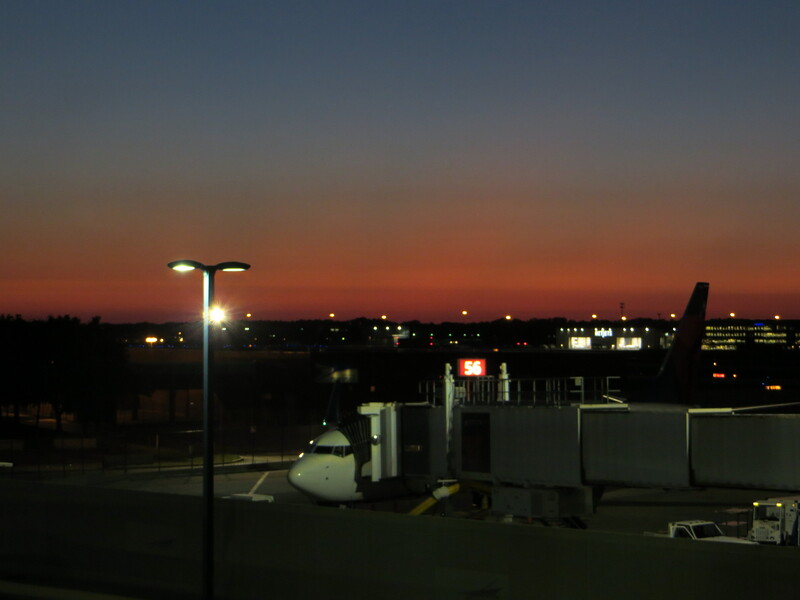 A cab ride to Hobby Airport, a connection in St. Louis, some waiting in lines, a hurried sandwich, and a thousand miles later, I got home just as the sun was setting over the runways of Port Columbus. The more I travel, the more I have come to value airports and hotels by the availability of free wireless access to the internet. 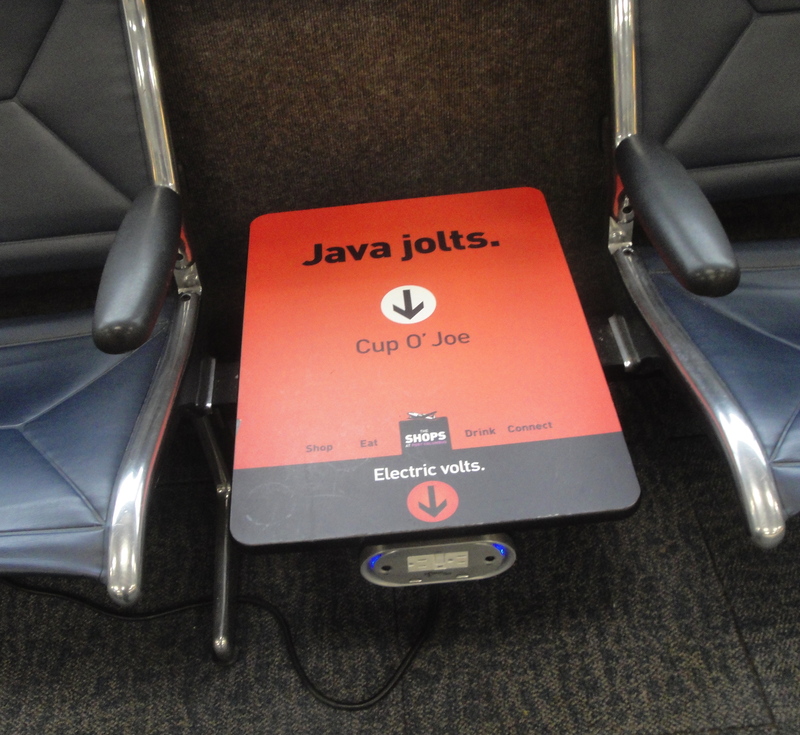 For airports, the availability of plentiful plug-ins also factors into the mix. By these two crucial measures, Port Columbus fares pretty well. The seating areas have lots of plug-ins that allow you to recharge your collection of electric devices after a long day on the road. 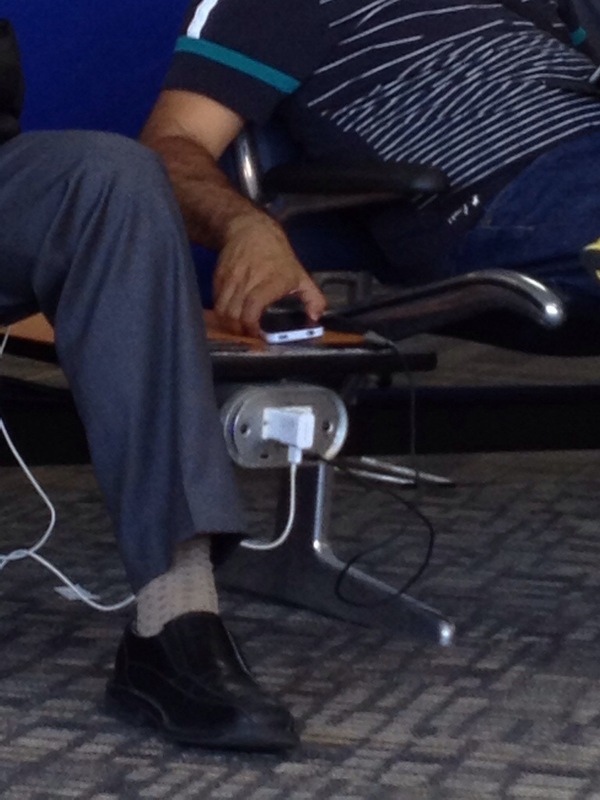 The wireless is free and seems to be available throughout the airport — or, at least, at the gates I’ve used. The free wireless is advertised through a corny campaign that invites airport patrons to visit “Wai-Fai Beach” and features a little grass-skirted hula dancer figure, but I don’t care. 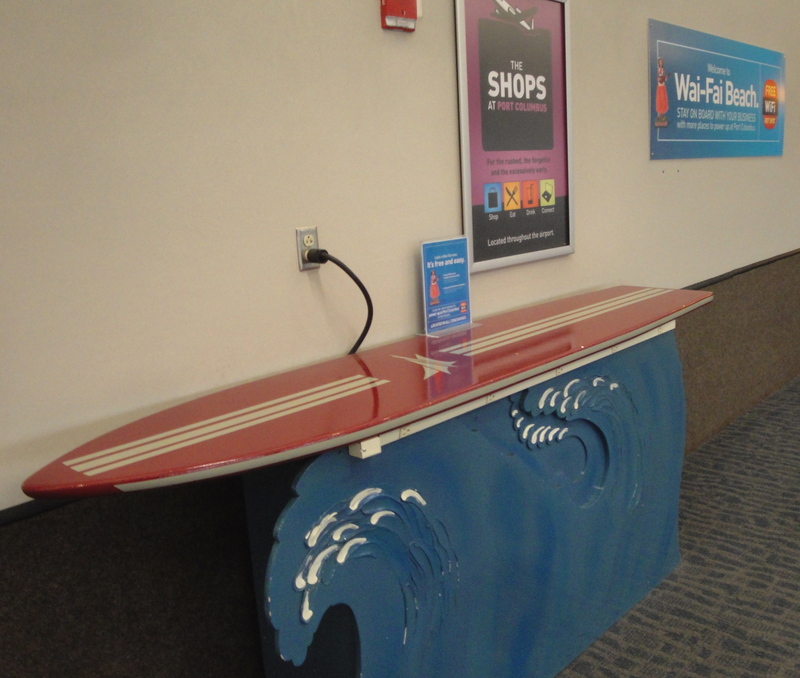 I’ve used the kitschy surfboard as a plug-in point when the seating areas are filled, and I appreciate the service. It’s gotten to the point that I become irked if I can’t find lots of outlets and free wireless at airports or in my hotel room. It’s bad enough when there is no wireless, but it is even worse when you have to register and pay for it. I really feel like I’m being nickeled and dimed to death. I’ve started to ask my secretary to check to see if the hotel has free wireless. If it doesn’t, and I can free wireless at a competitively priced alternative, that is where I am going to take my business. I’m not saying I’m entitled to free wireless, but if Port Columbus and many hotels can provide it, why can’t everybody?